With Thanksgiving upon us, Nourish Now is working with their volunteers to pack up food for the holidays. Each Thanksgiving, they feed over 1,000 in the area. Nourish Now is able make this happen with the help of over 150 different restaurants, catering companies, and grocery stores. Easterns Automotive Group and Fox 5 DC got word of all the hard work that Mayers and his team are doing and decided to do their part. Easterns donated about 75 30-pound turkeys and dozens of pumpkin pies to go with the Thanksgiving meals they are preparing to send out. Please click here to learn more about Nourish Now and how you can either volunteer or donate. 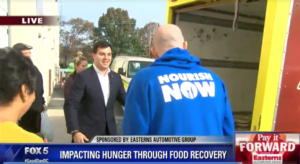 Being in the car business for over 30 years, Eastern Motors understands the importance of giving back and helping the amazing people of the DMV community that has continued to support them in return.